Kalabaka (Greek: Καλαμπάκα, Kalabáka, alternative transliterations are Kalambaka and Kalampaka) is a town and a municipality in the Trikala regional unit, part of Thessaly in Greece. The population was 21,991 at the 2011 census, of which 8,330 in the town proper. 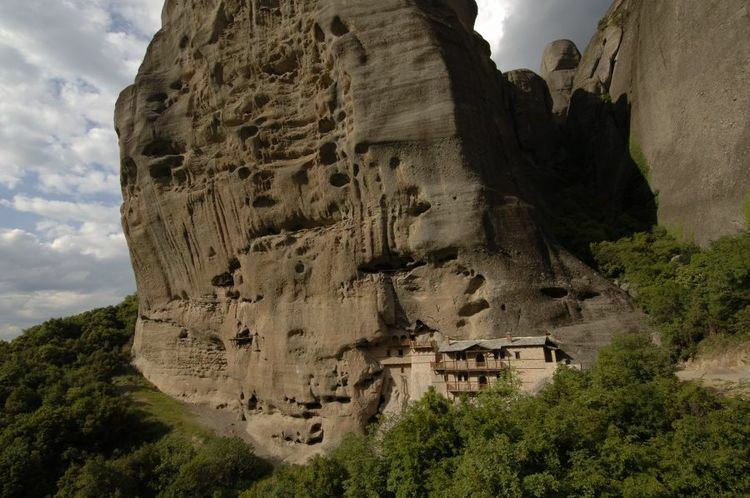 The Metéora monasteries are located in the town. Kalabaka is the northwestern terminal of the old Thessaly Railways, now part of OSE. In 1995 an ancient tomb was found in Kalabaka dating from the 20th century BC. A Greek inscription on the wall of one of the town’s oldest churches (Saint John the Baptist) testifies to the existence of an ancient Greek settlement under the name Aiginion. The town was built on the location of the ancient city of Aiginion, founded during the Hellenistic period which, according to Strabo, belonged to the people of Tinfei. It is mentioned several times by Livy during the Macedonian War, and after the Third Macedonian War in 167 BC, it was destroyed by the Romans. During the civil war between Caesar and Pompey the city was occupied by Domitius Calvin. In the 10th century AD, it was known as Stagoi (Στάγοι), a Byzantine fortress and bishopric. Of its medieval monuments, only the cathedral, the Church of the Dormition, survives. It was a late 11th- or early 12th-century building, built on the remains of an earlier, late antique church. Relics of an ancient Greek temple – probably of god Apollo – have been incorporated in the wall of the town’s oldest and most renowned church, dedicated to Virgin Mary. Stagoi is first mentioned in Diatyposis written by the Byzantine Emperor Leo VI the Wise (886-812). In 1163 there was a reference to the castle of Stagoi. In 1204 Stagoi fell under the Despotate of Epirus. At the end of the 13th century they fell under the Duchy of Neopatria. In 1334, they were taken over once more by the Despot of Epirus, John II Orsini, and shortly thereafter they came once more under the control of the Byzantine Empire. In 1348, they were conquered by the Serbs of Stephen Dushan. They reached their peak under the rule of his brother, King Simeon Uroš. When the Turks conquered Thessaly, Kalabaka was placed under the administrative rule of the Pasha of Larisa and later on of the Sanjak of Trikala. It was named "Kalabaka" six or seven centuries ago. It is of Turkish origin and means "powerful fortress". It has been Anglicized variously as Kalampaka, Kalambaka, Kalabaki, and Kalabak. From the beginning of the 10th century, Stagoi was referred to as an episcopal see, thereby enjoying privileges and donations from the Byzantine emperors throughout the Middle Ages. It owned significant stretches of land and had dependent farmers in neighboring settlements. Besides the fields of northwest Thessaly, its territory included an extensive mountainous zone in Asia and central Pindos. The bishopric of Stagoi, a suffragan of the Metropolis of Larissa, was maintained, with some small intermissions, up to 1900 when it was merged with the bishopric of Tricca to form the Metropolis of Tricca and Stagoi with the town of Trikala as its seat. 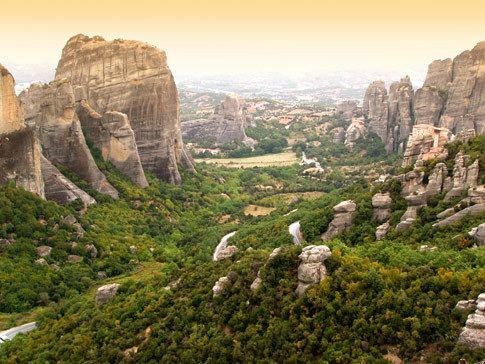 It was reestablished in 1991 and has been operating ever since as the Metropolis of "Stagoi and Meteora" with its seat in the town of Kalabaka. The province of Kalabaka (Greek: Επαρχία Καλαμπάκας) was one of the provinces of the Trikala Prefecture. It had the same territory as the present municipality. It was abolished in 2006. The town is situated on the foot of the Meteora peaks. Kalabaka was voted as one of the most beautiful places in Greece by the Skai TV show I LOVE GR.